For as long as I can remember, my mom's been making the same pecan pie every year for the holidays, and so have I. Last year, I suggested she add a little chocolate to the filling, and it was a really nice change from the usual. 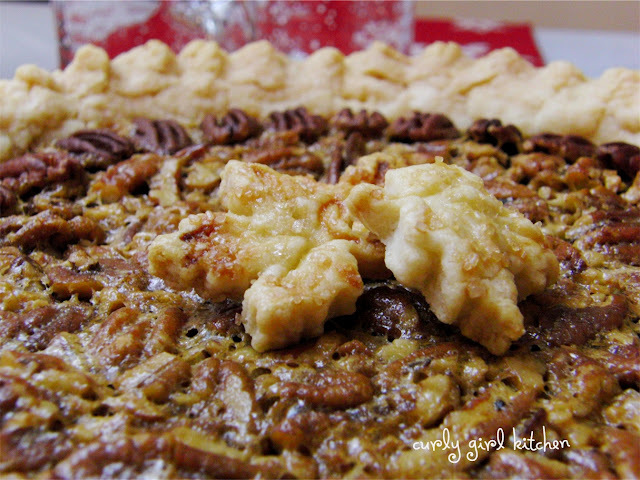 It's a pretty standard pecan pie recipe, but one I've always appreciated for its rich, sugary filling and lots of pecans. 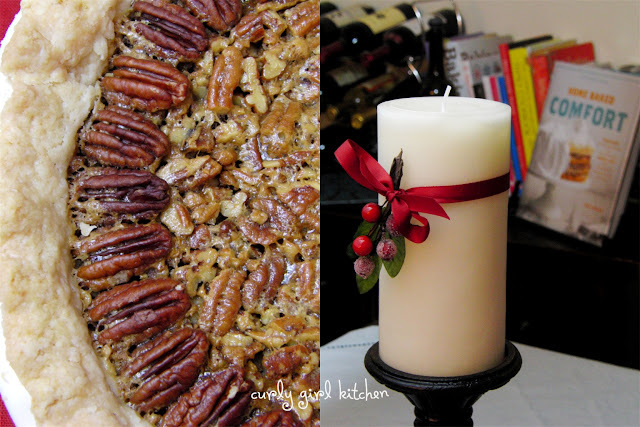 Pecan pie is my favorite pie of the holidays, and when faced with a choice of two or three pies, pecan will almost always win. This year, though, I've been wanting to try something different, and a stroke of bad luck with that recipe gave me the motivation I needed. It was very much a fluke, but that tried and true recipe that we've made over and over actually flopped on me, not just once, but twice. Instead of a nice, gooey filling, it was very liquidy, full of corn syrup that never set up. The first time it happened, I thought I must have done something wrong, left out a crucial ingredient, or not baked it long enough. Or something. After the second time, though, I was beyond frustrated and simply had no idea what had happened. And so, I took the failure as a chance to make something better and started working on my own recipe, one using some of Jamie's favorite flavors - caramel, chocolate and bourbon. 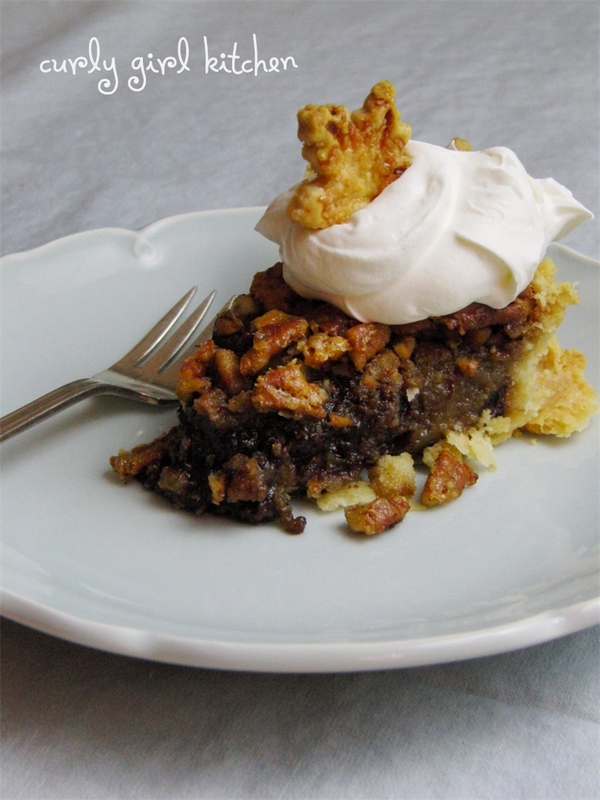 After tweaking the ingredients for the filling - less corn syrup, more butter, a little bourbon and caramel, spices and chocolate - I started thinking about the way the pie is baked. I feel like baking a pecan pie at 350 for the whole baking time has the potential to burn the pecan crust that forms on top before the filling has a chance to set. So I decided that low and slow was the way to go for this pie. 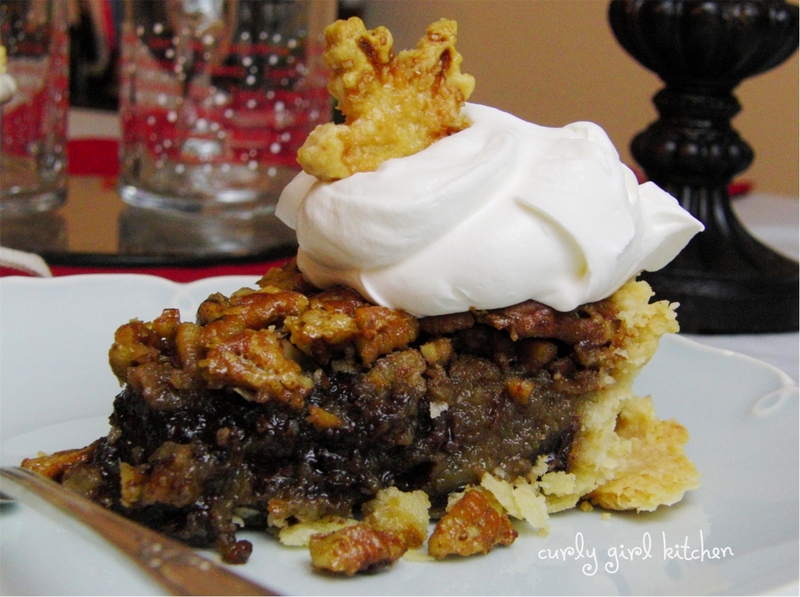 I baked it initially at 350, just for 10 minutes to get things going, then turned the heat down to 300 so the pie could luxuriate in the low heat for almost an hour, letting the filling thicken while the pecan crust on top was perfectly toasted. And let me tell you, even as I know the words I'm about to say sound totally biased since this is my pie, it was the most incredible pecan pie I'd ever made or tasted. Period. 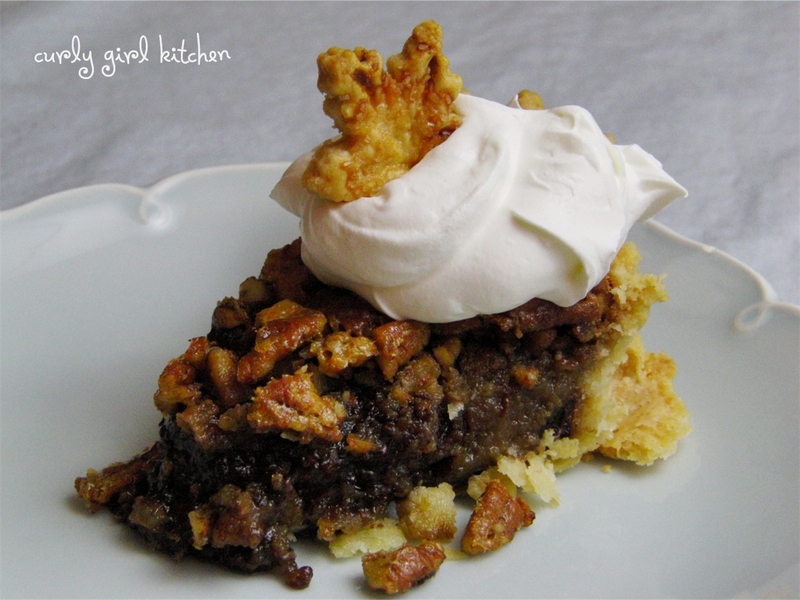 It wasn't too sweet or corn-syrupy, as many pecan pies are, and the hints of chocolate, caramel and bourbon made a sinfully delicious marriage of flavors in the gooey filling. 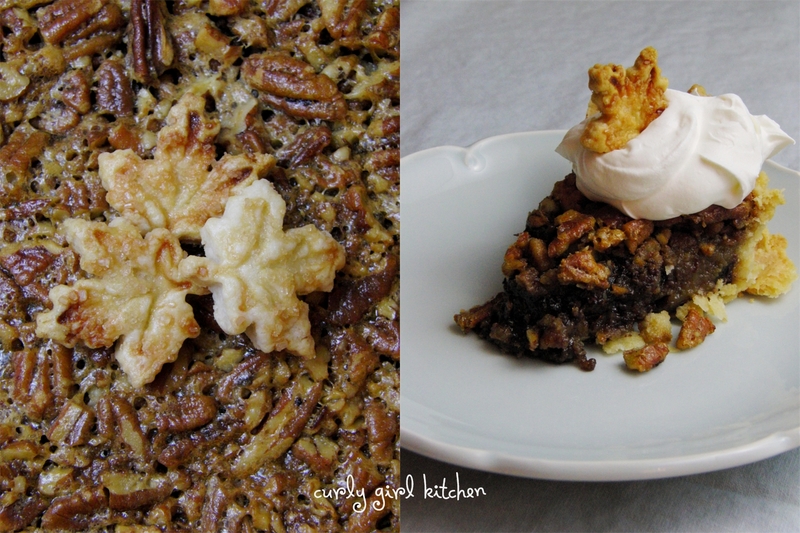 It sure looked prettier, too, with the circle of pecan halves around the edge and a few pie crust leaves for garnish. Roll the dough out on a lightly floured surface then transfer to a deep dish pie pan. Trim the edges, saving the scraps for decorative cutouts using cookie cutters or pie crust cutters. Refrigerate for 30 minutes. In a bowl, whisk together the eggs, brown sugar, caramel sauce, corn syrup, butter, vanilla, bourbon, flour, salt, nutmeg and cloves until smooth. Stir in the chocolate and chopped pecans. Pour filling into the pie crust. 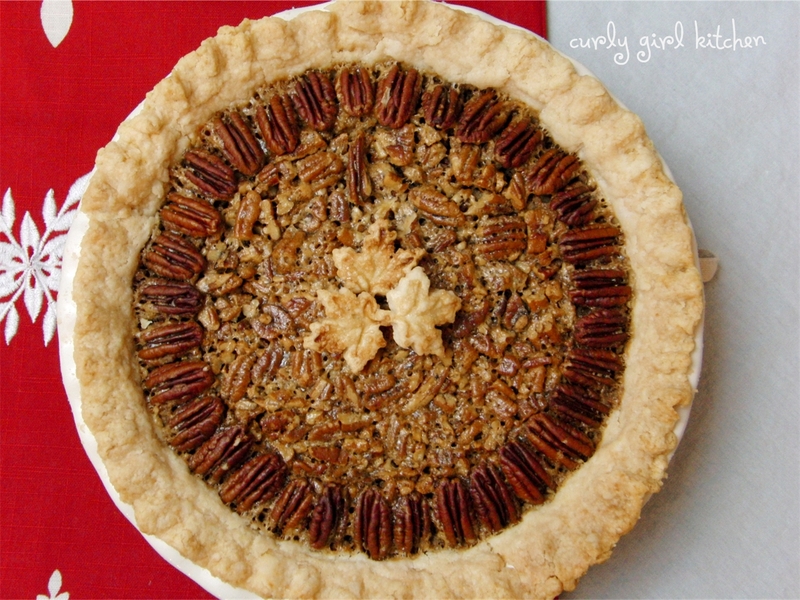 Place the pecan halves around the edge of the pie, right on top of the filling, for a decorative look. Bake the pie at 350 for 10 minutes. Reduce the oven temperature to 300, and bake for an additional 45-55 minutes, until the filling seems to be set. During the last 15 minutes of baking, jiggle the pan every 5 minutes or so; once it just barely wiggles when you shake it, the pie is ready. Since you’re baking it at a low temperature, there should be no danger of the crust over-browning, so there’s no need to cover the edges. Cool on a wire rack for 2 hours, and serve warm, or cool completely and serve at room temperature. 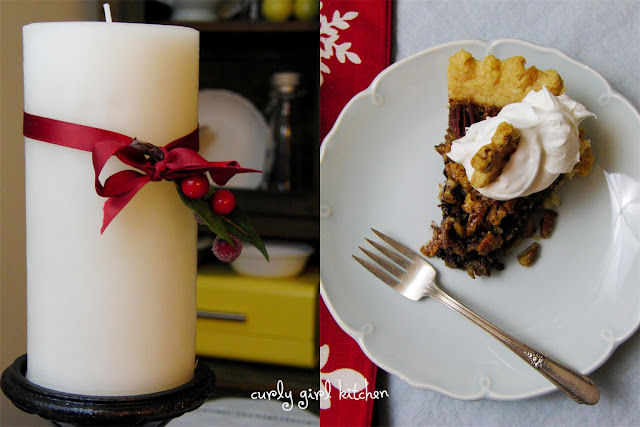 Garnish with whipped cream and pretty pie crust cutouts. Note: to bake the decorative leaves or other cutouts, place on a parchment lined baking sheet. Brush lightly with water or an egg wash and sprinkle with a little coarse turbinado sugar. Bake for 12-15 minutes until golden brown. Cool.